Ever since I had proper Pad Thai at a nice restaurant I've been looking for a good recipe. I came across one in Delia Smith's How To Cook book. It was good although it didn't have any sugar or sweetness in it which was strange. Anyhow, me and the hubby liked it very much we did not mind the lack of it. A Thai acquaintance told me that Pad Thai without sugar is called "Char Kuey Thieow". Meanwhile I'm still on the lookout for that ultimate Pad Thai recipe. Pour boiling water over the rice noodles in a bowl and soak for about 10 minutes or until noodles is almost cooked and tender to the bite. Drain and set aside. Soak dried shrimps in hot water for 10 minutes, drain, set aside. Mix lime juice and fish sauce in a small bowl. 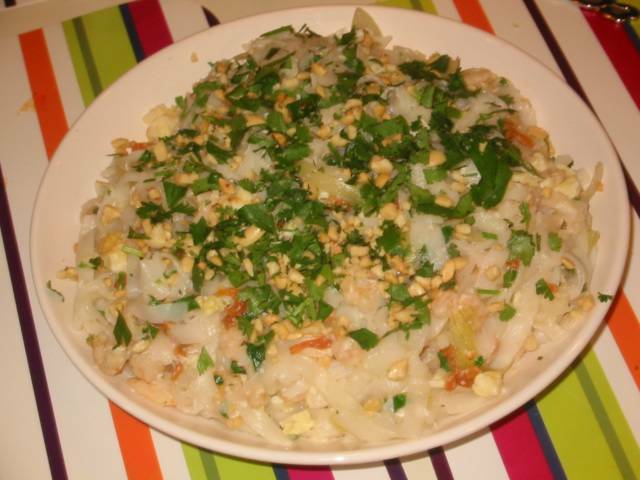 Mix coriander, green onions and peanuts in a container. Heat a little oil in wok and fry half of beaten egg (as an omelette). Remove from wok and slice into small pieces. Heat the 2 Tbsp oil in wok and saute garlic and onion until translucent. Add chilli, stir fry for half a minute. Put in dried shrimps, cook for about a minute. Add fresh shrimps, cook until it turns pink (around 3 minutes). Add lime juice and fish sauce mixture. Bring to boil. Add noodles and mix until noodles has almost absorbed the sauce. Push noodles to the side of the wok and make a well in the middle. Pour the rest of the egg in the well. Let the egg cook a little and then mix in with the noodles. Sprinkle about half of the coriander, green onion and peanut mix in the wok. Stir and mix for about 30 seconds. Transfer into a serving plate and sprinkle more of the coriander mix on top before serving. This is something that I have always liked ever since I tasted it at a small yet popular Thai restaurant near UST. You gave me an idea. Maybe one of these days I will try this too, though I will have to do that when only me and my kids would eat, not including my hubby.